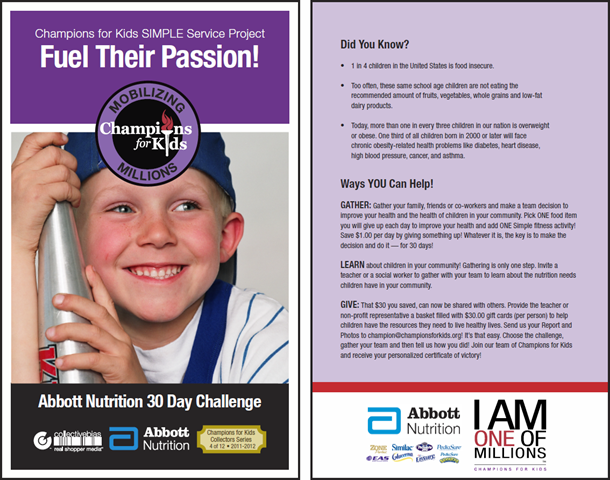 Champions for Kids: Fuel Their Passion! • 1 in 4 children in the United States is food insecure. • Too often, these same school age children are not eating the recommended amount of fruits, vegetables, whole grains and low-fat dairy products. • Today, more than one in every three children in our nation is overweight or obese. One third of all children born in 2000 or later will face chronic obesity-related health problems like diabetes, heart disease, high blood pressure, cancer, and asthma. improve your health and the health of children in your community. Pick ONE food item you will give up each day to improve your health and add ONE Simple fitness activity! Save $1.00 per day by giving something up! Whatever it is, the key is to make the decision and do it — for 30 days! teacher or a social worker to gather with your team to learn about the nutrition needs children have in your community. GIVE That $30 you saved, can now be shared with others. Provide the teacher or non-profit representative a basket filled with $30.00 gift cards (per person) to help children have the resources they need to live healthy lives. Send us your Report and Photos to champion@championsforkids.org! It’s that easy. Choose the challenge, gather your team and then tell us how you did! Join our team of Champions for Kids and receive your personalized certificate of victory! I Am One of Millions, Join Me!